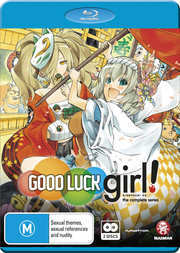 Binbo-Gami Ga: Good Luck Girl: The Complete Series S.A.V.E. Lucky girl vs. god of misfortune. Who wil crack first?! Ichiko gets lucky a lot. She's rich, beautiful, smart, stacked, and better than you at everything. But there's a reason life always goes her way: she unwittingly steals happiness energy from everyone else! Momiji - a poverty god with a freakishly huge syringe and a bunch of oddball charms - has to take Ichiko's extra good fortune and return it to her various victims of circumstance. Like an Adderall-raddled cat-and-mouse chase in a funhouse full of pop culture references, the spirit of shortcomings and her self-absorbed subject stick each other with jabs, gags, bizarre bets, and dirty tricks aplenty. It's a side-splitting ride, and everyone's seatbelt is defective. But how many blows to the ego can Ichiko take before she grows a sympathy gland and stops hogging all the happiness?